A nice thing about our Finest Tailors series is that, as we add more tailors to it, each becomes a reference for the next, making comparisons easier. 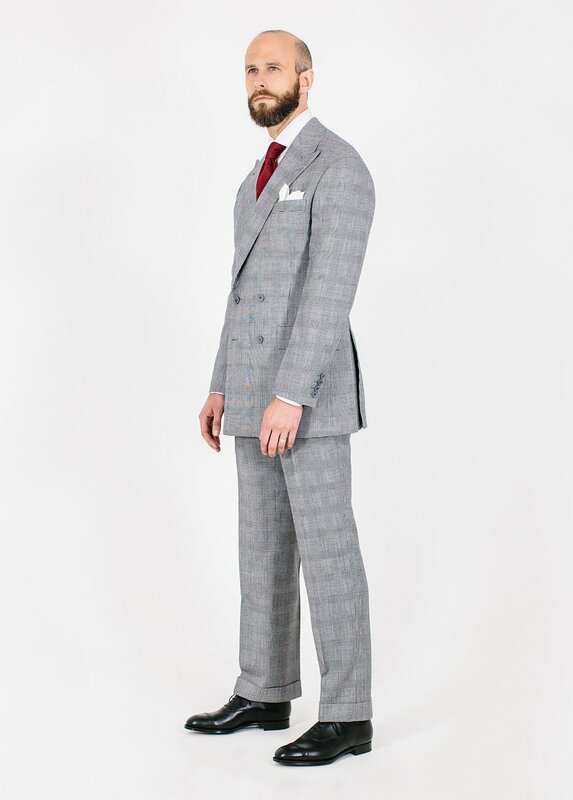 This Henry Poole suit, then, makes an interesting comparison to the Richard Anderson tuxedo we featured first. Both are traditional Savile Row tailors, both are known for relatively straight, structured styles, and yet there are significant differences in the details. Craig Featherstone cut me this double-breasted suit in 2011. 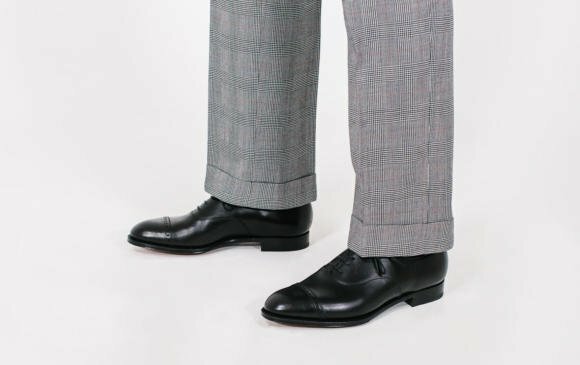 We ran a nine-part series on the process, in fact, including coverage of the measuring, fitting, trouser making and coatmaking. The cloth is a 10oz wool by Fox Brothers, woven exclusively for Henry Poole as its ‘Seafield check’ – referencing the first estate to adopt the pattern we now usually refer to as a glen check, and for whom Poole historically made for. It is distinctive for its fine burgundy overcheck. I’ve been very pleased with the suit over the years, although the relative dandiness of the check, and the double-breasted style, have limited its use. A single-breasted would have been easier to combine with conservative accessories, and wear to the office. I’m also still not sure on the four-button style. I had seen it on a friend and thought it was a nice, subtle alternative to the normal 6×2 (six buttons, two of them fastening). And it was cut exactly the same as a 6×2, just with the top two buttons removed – so I could add those two buttons whenever I wanted. Somehow over the years, however, I have remained slightly unsure of it and also not added those buttons. It doesn’t help that I’m also still not quite sure on the grey horn they are made of. This was intended to make it easier to wear the suit with both black shoes and brown, but they lack the texture of the brown horn I love so much. Considering the suit afresh now, I might swap the grey for a nice variegated mid-brown horn, and then re-assess the top two buttons. In terms of style, the suit is made in a very similar way to that Richard Anderson tux. But the cut gives it considerably more shape. So there is a light shoulder pad (by English standards), a standard three-part canvas, and a little drape in the chest. 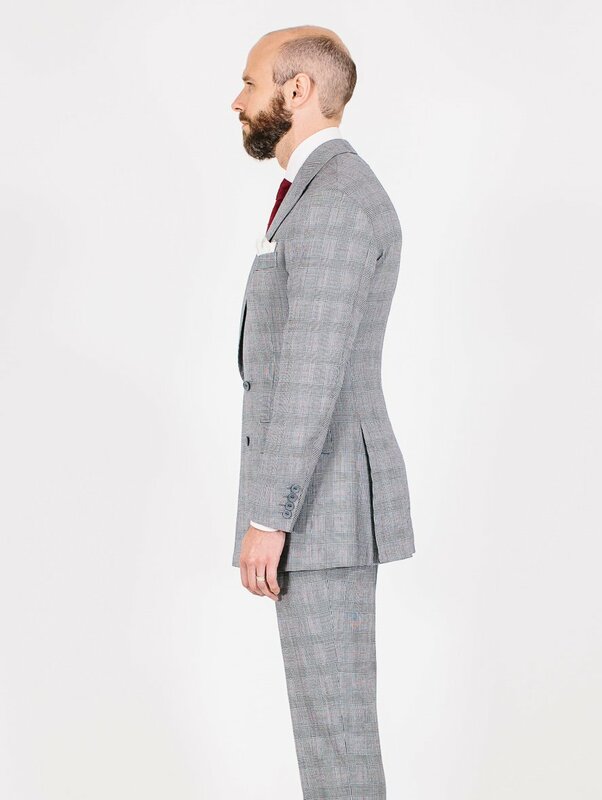 The shoulder of the Poole suit is cut rather wider, however: 6⅞ inches from the back neck, rather than 6. This extended shoulder runs slightly beyond the natural end of my shoulder, and is accentuated by the use of a sleevehead roll to give a slightly roped effect at the top of the sleeve. 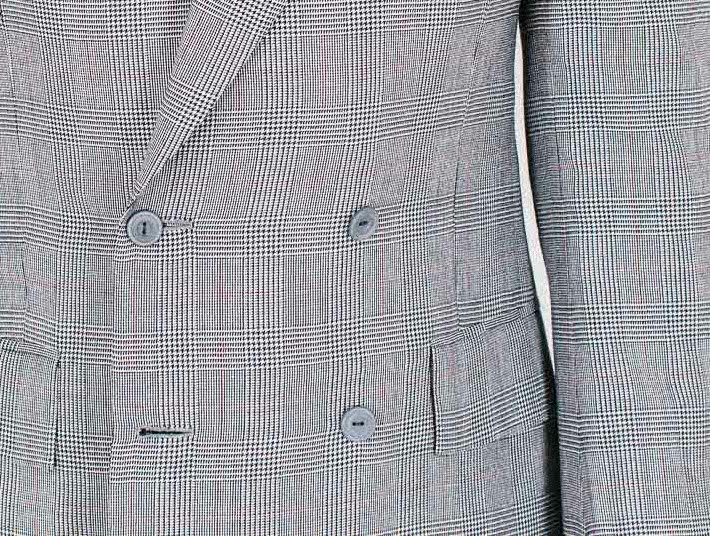 There is also more shape to the waist of the jacket – something particularly evident in the side-on view, below. You can see here how the jacket follows the shape of my lower back, curving inwards before running out over the seat. The hips are also cut a little fuller, and the vents higher (10½ inches). All this increases the effect of the ‘X’ shape that we talked about last time – the top and the bottom of that X are wider, and the middle narrower. The position of the buttoning point also makes a difference. Although it is the same height here (20 inches) as the tuxedo, the jacket is a touch shorter (32 inches rather than 32¼), which means relatively, the buttoning is lower. The bottom of the ‘X’ is shorter, making the top seem bigger. Of course, given this is a double-breasted jacket rather than a single, we cannot compare the opening of the quarters. And the longer, diagonal lapel of a double-breasted jacket adds visually to the effect. But the rest of the cut – the most significant points – can be directly compared, and the flattering nature of those larger shoulders and close waist is clear. The DB lapels, by the way, are pretty modest. They are 3⅞ inches wide, and seem narrower given the breadth of the shoulders. It would be interesting to see the effect that wider, Italian or Milanese-style lapels would have on a cut like this. The sleeve is pretty standard, tailored subtly and finishing in an 11⅜-inch cuff. The jacket is made with a side body (a panel down the side of the jacket), unlike the tux but more standard for Savile Row. Interestingly, the work inside is perhaps the least of the Row suits in this series. In the original posts I noted that the collar was padded by machine, and the lining is machined to the facing of the jacket inside, where others do it by hand. This is also one of the few suits with the in-breast pockets cut straight into the lining, rather than being supported by cloth running around them (shown below). Although a small point, this does mean they’re not quite as strong in the long term. In the images, by the way, I think I have hiked up the trousers a little too far to try and show their lines. In reality they drop a little lower, just sitting on top of the shoes. The accessories here are from the Anderson & Sheppard Haberdashery, and the shoes from Edward Green. I should have mentioned previously that they are sponsoring this series and therefore are providing these pieces throughout. The Edward Green shoes are Berkeleys in black calf. Next up will be Anderson & Sheppard. And there the proportions get wider again. 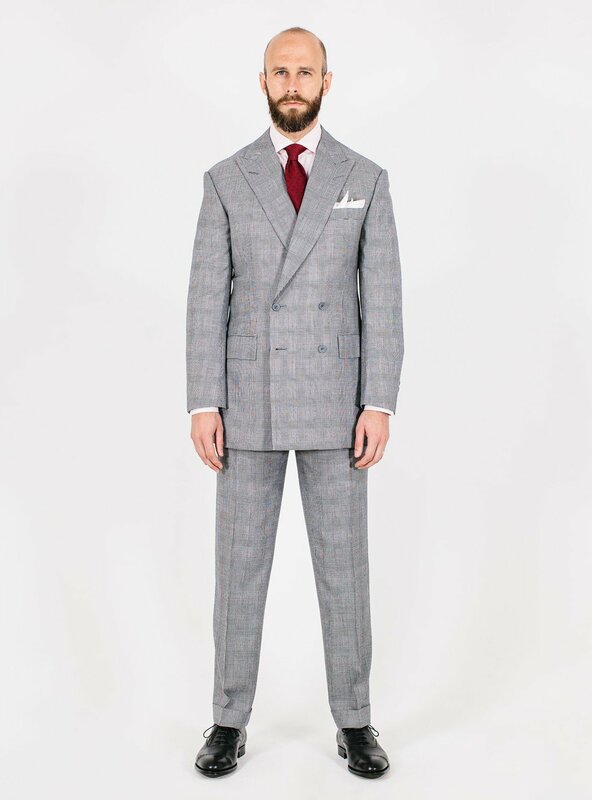 You can follow the discussion on Henry Poole double-breasted suit: Style Breakdown by entering your email address in the box below. You will then receive an email every time a new comment is added. These will also contain a link to a page where you can stop the alerts, and remove all of your related data from the site. Nice suit Simon.The 4*2 buttoning is fine..I would’nt worry too much about a 6*2 config…..although that would be my default option on a db.To add a louche or casual look to the suit I would just button up the lower one….looks nice I think…but what do I know! I like the black shoes much nicer than brown with light grey summer suits…it also has the advantage here of toning down the exuberance of a Glen check suit.On the latter point I would have chosen a navy or black tie…red in my opinion is too striking with a check suit.Knitted is always good….Bondian. Thanks. Yes, red is a little bright for what I normally wear – trying out a little more colour than I normally wear. Really interesting thanks. Which pair of EGs are those oxfords? Would you say they are a good go to for work / wedding shoe? Adding my vote too (doesn’t necessarily need to be next after A&S given you haven’t shot the photos—just at some point). In particular, would be nice to know what are the compromises if going with more affordable bespoke. Apologies, just read they are the berkelys. Rest of my comment stands! Fair – don’t think the chelsea comes in the more rounded last though. Seems to be the same problem with C&J – the handgrade collection only includes the longer lasts. Would like a suggestion of where to find a conservative british oxford to a very high quality as I can’t find anywhere! I have both Alfred Sargent and Vass oxfords on rounded lasts. The Vass F last is especially comfortable on my higher instep and with a higher heel cup, but the AS sole and waist are above anything I’ve seen at that price point. Thanks Hugh! Do you know where I can find in London? Have a look at the Edward Green 202 last. Do you mean a ready-to-wear British Oxford? Try any of the Northampton shoemakers. They’re as conservative as they come (and thank God for that). Have a butcher’s at the Edward Green 202 last. Simon, I’m afraid this (impressive) suit is best seen in person, and not in digital photographs. At least on my screen, the nice glen check pattern is obscured by a strong moiré effect. I tend to feel that one can get away with a bold choice of fabric or an unusual cut but not both at the same time. 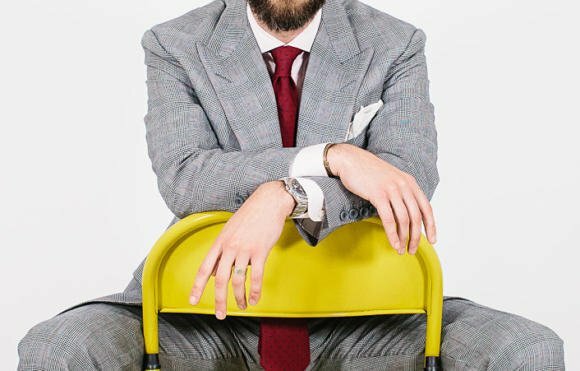 Even if you can make it work, it’s going to severely limit the number of situations in which you can realistically wear such a suit without sticking out like a sore thumb. Interesting that you commissioned this one early in your bespoke journey, as that’s often when one tends to go a bit mad with the nearly limitless choice of options available. And what’s with the Christine Keeler-style poses?! It’s enough to put a chap off his lunch! Technicaly very competent but I think it’s a case of great suit but doesn’t do a thing for you. It just looks terribly bland. Obviously it is the essential nature of the job that you hop from one tailor to another. In the real world that wouldn’t happen. As I’ve said before one of the great merits of this site is that you can bring us great things and make mistakes for us. That said, if you were a mere mortal you would have one or two tailors and I suspect that Henry Poole wouldn’t be one of them. But I may be wrong ? I agree with you, David, but would go further. It is true that the suit does not do a thing for him. More importantly, a UKP 5,000 bespoke suit from Savile Row doyen Henry Poole simply does not fit him! There can be no argument that the single most important area of fit for any suit is the shoulders. Both sides on this suit visibly overshoot the natural shoulders, making the jacket look at least size too large and giving a baggy look to the shoulders and chest. In my own recent and repeated experience with Henry Poole I found similar fundamental errors in tailoring that have twice caused me to reject bespoke suits they have made, with owner Simon Cundey’s acknowledgement that gross mistakes have been made. Thank you, Simon, but the second photo (front-on) does show visible divots at the top of both arms, indicating a poor fit. As others have indicated, and I must agree, the suit has many, many problems. 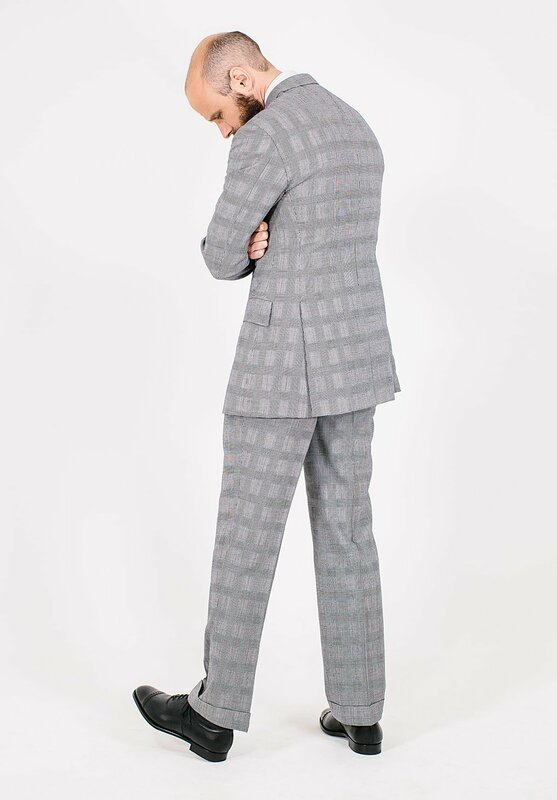 A glen-plaid check in a double-breasted lounge suit is far too busy, appears visually disorienting, and is certainly inappropriate for business wear. The lapels of the jacket are too narrow, given the overhang of the shoulders, and accentuate the bagginess of the chest drape. The casual 4×2 , rather than a more conventional and formal 6×2, button arrangement makes the jacket bottom-heavy and look rather odd and out-of-place on a town suit. The grey buttons are lost in the welter of glen-plaid and unfortunately look rather tacky. The trousers seem to be cut too short and are too narrow and tight, giving a blue-jeans-like appearance without drape to the leg and posterior, and making the shoes and feet appear disproportionately large and prominent. I apologize if my comments seem overly froward, but since the purpose of this series is a studied appraisal of past bespoke assays, a critical perspective may prove of some use. Kind regards. Thank you Paul, it is. Bit of a shocker this one. Actually emphasises the sloping shoulders rather than compensate for them. Sexton DB a much better example. I would agree David. Perhaps it’s the photography or merely a difference in taste but this is the least flattering suit I’ve ever seen Simon in. In fact, I was quite taken aback by how “off” it looked to my eye. I can totally sympathise with your comments on the buttons. 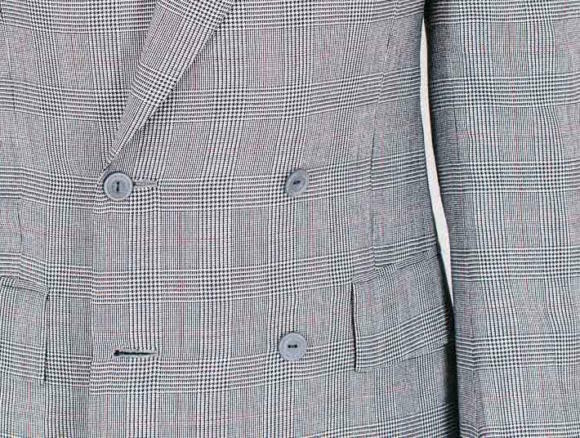 I’ve always felt that a mottled brown horn button at whichever end of the light/dark scale is preferable most likely in an effort to distinguish them from plastic buttons that you might find on a cheap RTW suit. I’m tempted to say shades of brown are more common in nature and therefore appeal to those of us that like those natural elements in muted colours, buttons, leather etc but I can’t escape that there are a lot of natural rock formations in grey that undermine my thinking! How often do you wear suits like this? Splendid cut of jib, what what? But turn-ups on a city suit? They just look orf to me. On the in-breast pockets, cutting them into the lining seems to be – I stand to be corrected – the Italian way. It the sort of the thing done by the tailor (or coatmaker, if the house has specialised workers) rather than the cutter, so you’ll get in even on some Row coats. I had the lining torn around the pockets in some of my office suits, what with carrying mobile phones and wallets and various Important Things and suchlike. I suppose you just have to be extra careful. Otherwise, the cut is clean and understated, the fit looks good, the trews drape nicely, and the skirts are the right length. I’d wear this piece. That manner of sewing the lining is far more common on English suits. The cloth extension onto which the pocket is sewn and the lining trimmed around is in fact called a French facing. They are not terribly common on English suits. In fact, more than a few English makers (notably Huntsman) will cut a French facing and trim the lining right up against the pocket jettings, making it look like a regular machine sewn lining. Some makers will sew the pocket to the lining and have it floating away from the facing. A few of the Caraceni houses do that and still hand sew the lining. It leaves me baffled. Well, I tend to sympathize, but if you’re being economical with your cutting, it makes sense. A facing with an extension is harder to work into the lay of the pattern than simply cutting an extra piece. There are very talented cutters on either side, as I’m sure your own experience will attest. Another thought, perhaps the piece could be a deliberate measure taken to ensure the pocket is sewn on the straight of grain if it’s otherwise on a slant? You say you aren’t sure about the four button style–I wouldn’t presume to read anyone’s mind, but it might be because the 4×2 configuration is typically used on patch pocket suits and jackets, where the patch breast pocket necessitates the removal of the top two buttons. Still, the wonderful thing about custom is that you can do whatever you want. It’s a beautiful suit, and I hope it serves you well for many decades. How are you measuring jacket length please? I’ve realised that I’m not a big fan of the 4×2 jacket unless there’s a patch pocket or it’s on a very short man where a 6×2 would be crowded. The 4×2 often looks bottom heavy, as your jacket does. Generally, a 6×2 is more balanced. I’ve come to the conclusion that the 6×2 is the most balanced double-breasted style, though a 4×1 can look very balanced if the button placement is right. While I am a fan of those grey buttons, I prefer them on a solid or semi-solid grey suit. I put black horn buttons on my glen check suit, which match the black in the check. It almost limits me to wearing black shoes with the suit, but I don’t have a problem with that. I don’t wear suits all that often, and I love my black shoes that don’t get enough wear. I wear brown shoes more often since I usually wear odd jackets. I think brown buttons would go very nicely with this suit. I think your idea to put brown horns buttons on it and make it a 6×2 is fantastic. I also like smoke mother of pearl buttons on a black and white check, since the variation in the colouring brings out the lights and darks in the check, and you can still pair brown shoes with them very nicely. Stylish cut that will last. Re. the cloth it’s a classic standard, as such it will move in and out of fashion but will always be there. Stick with the 4 on the buttons – they have balance but agree with the change to a brown. One point: you mention 11 3/8” cuff – this must be circumference? 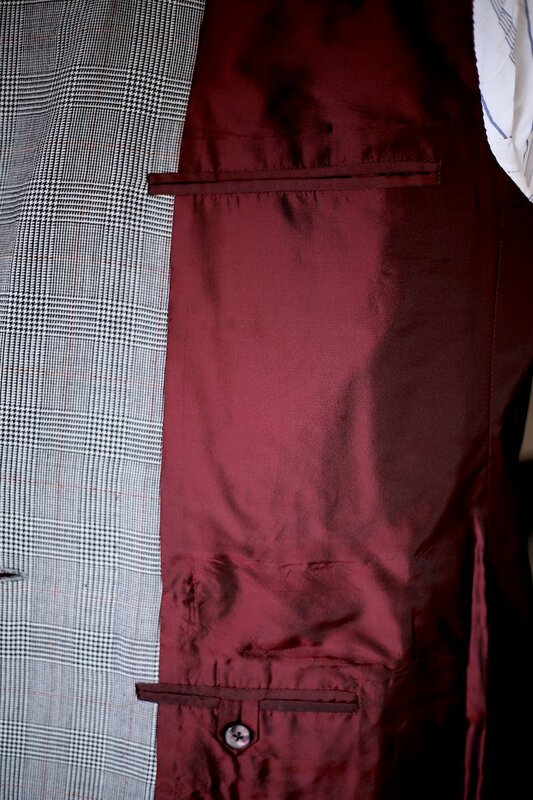 Suggest keeping measurements to one standard – you give trouser hem as width – it just gets confusing otherwise. One last point, you seldom include how you feel with the suit on – I know it’s subjective – but it would be interesting to know. Nice point on circumference v width, I’ll change those. In terms of how the suit feels on, you mean how comfortable, how soft? Thanks for this instructive post! “In the original posts, you write, I noted that the collar was padded by machine, and the lining is machined to the facing of the jacket inside, where others do it by hand.” Are there significant implications, as to durability for instance, when done that way? And when on, do you notice any difference if compared with other jackets? I also wonder whether your remark isn’t relevant when read within the context of your post dedicated to “the 1-6 suit rating system”. No, machining the lining to the facing is not weaker, indeed it’s probably stronger. Doing by hand is largely about aesthetics – and makes it easier to replace. Personally I’ve never noticed a difference between hand padded and machine padded collars – there is more with lapels and chest generally. I do not like it when the armhole seam is strongly angled outward (it gives a saggy silhouette, eg your right upper arm inward-looking, unflattering contour). Do you think it is the tailor looking for a 90 degree angle with your strongly slopped shoulder line or just a necessary condition for an extended shoulder? As someone pointed out, a fairly bland suit. Other than your A&S gray DB suit, I am yet to see an english suit look as good on you as your Neapolitan jackets (or suits). On the point of fit, whats going on with the right shoulder? Surely, that would give pause to anyone thinking of shelling out five thousand pounds sterling. Interesting to explore more what people mean by bland, or by looking good. Flattering particular aspects of the body? Having a stronger or subtler style? The right shoulder is actually fine. As ever, we could have spent 20 minutes getting every line of the suit tugged to perfection, then have me hold my breath, but that feels too artificial. And the beauty of the fit of bespoke is in movement, not being static. Any RTW suit can look good standing stock still. It is I that used the ‘bland’ word and to explore it further (at your request) I would elaborate by saying that it’s non – descript or of no particular use. We all have suits like this lurking around at the back of our wardrobe that serve no particular purpose. If we are going to a formal meeting they simply don’t match the power of that well cut navy blue. If we are going to a creative meeting or environment it will make us look like a pork chop in a synagogue. If we are going out on the town it will make us look like our dad. If we are going to a wedding it will make us look like the most boring member of the congregation. If we are going to a funeral it simply isn’t dark enough. In short, it is just plain ‘BLAND’ and as a consequence serves no particular purpose. I have ploughed this furrow for a very long time and my advice is simple. To spend big is fine but don’t duplicate and get maximum bangs for your buck. I’d simply never wear this and I suspect neither would you and that has to be part of the review and critique of each commission. Very interesting, thanks for expanding David. What would David wear to a wedding? Be careful, Simon. You are slipping back into the Royal ‘we’. I wonder whether this suit, or any lighter suit, may suffer from being shot in a white studio in a way darker tones / colours would not. Are you shooting in a white studio to give a consistent backdrop through the series? Separately, I read your post on black suede shoes recently, struck by how much they added to the look of the recent Ciardi suit. Do you think suede be a good with the colour of this suit also? Great, great site by the way. Thank you. Interesting point, and yes we’re shooting in a white studio for consistency. Disagree with quite a few comments here, far less bland than most of your Neapolitan items here! Two extra button added to the top would vastly help balance and add to a classic look. The 4 buttons IMHO don’t fit a classic tailor like HP. Hi Simon! Loving this series–rather quite informative. May I know if your suit reflects the Poole “house style” in the sense that DBs are more representative of their output than, say, a 2B SB? Or, put another way, is the house’s aesthetics best displayed by such a model? Thanks! Three years ago , I commissioned a very similar one, and wear it around 4 times a year, mainly on weekend occasions where a dark grey or blue is too formal. Hi Simon, I mentioned the point on how each suit feels. By that I mean three things. Firstly the level of comfort, fit and drape. Is it a little too soft and without hold, converesly does it have too much hold in that it doesn’t flow with you. Secondly, how does it make you feel; wardrobe favourites give one confidence, comfort and compatibility with the surrounding or proposed event. The opposite may reduce confidence and make one feel conspicuous or out of place. By using these paradigms I wondered how each suit measured up. Lastly the very best of garments seem to move with rather than against the wearer in that, within the cut, they have an element of lattitude that allows for graceful movement (minimum fabric stretch, no binding, no constrictions etc.). Ideally one can therefore feel well dressed but at (nonchalant) ease. just for accuracy this is not Glen Urquhart; it POW. You’re right. Not being English, I didn’t have any reference points given how closely related both patterns are. Thanks for letting me know. This may be a suit you have to see in the flesh to be able to appreciate. From my monitor the busy overcheck pattern just does not come though and looks strobey. I also wonder about the fit re the shoulders – it may be deliberate, but it does not seem to flatter. I don’t wear double breasted (I’ve only had 2 DBs in my life) so I may be simply biased when I say I think this cloth would have employed better in a single breasted number, as the check seems inherently less formal. (though I could never describe it as bland). What are your thoughts on jackets with no vents? Can they look good ? I think the issue of the shoulders cannot be dismissed quite as easily as you do here, Simon. The fact is that the wider shoulder does indeed accentuate the slope of your shoulders. I have the very same issue and have concluded that a more structured look really is more flattering. Apologies if I wasn’t clear – I wasn’t referring to the width of the shoulder, as this is something objective that I had stated and measured, and is a definite feature of the style, yes. I was referring to comments around the cleanliness of that line or the top of the sleeve. An extended shoulder does indeed make my shoulders seem more sloped, as does cutting the collar higher up on the neck. Both lengthen that line and therefore accentuate it. You see a real case of that on the B&Tailor cut as well. I take it you like the slope because it breaks up the line of the suit, or do you simply favor the natural shoulder? Really love this post series, Simon! I’ve been looking into getting a “staple” bespoke suit made for myself (staple being a standard navy or gray plain suit). I’ve been reading up on a lot of your content on trying to find the best style or house that would best suit me. My issue is that I have a very athletic build – broad shoulders, pronounced chest and seat, and thigh area, with a very trim waist. I’ve found that more English style suits with heavier shoulder padding don’t compliment those with an athletic build. Would you have any recommendations on a “style” that would best compliment someone with an athletic frame? Would something with a very soft shoulder work best? Or something in between? It’s best to think of this in terms of what you want to minimise or accentuate. What is ‘flattering’ is so much more subjective. Have you read this post on those points. Simon, swap the buttons for brown horn. You won’t feel like “john major grey” any more, and you wont have a problem wearing black shoes either. Small step but big change. You’ll start wearing the suit more. Hi Simon, I have never commented before but your honesty is impressive, to admit having spent a lot of money but the item is lacking in some way. I like your style and emulate it when I can by buying used or O.T.P and do all my own alterations. As to the suit, the buttons are a little bland IMHO and I find the black shoes too ordinary for you ! This is a great blog and always good to get your updates. Trousers look good on you, if perhaps slightly wide-legged. With your sloping shoulders, I’d rather more padding there, and a more nipped-in waist. You are slim, but that fact seems concealed by this coat. Lovely. Great silhouette. Especially (to me) from the hanky and down. It would be interesting to hear your thoughts on wearing it with vest or not. Too much? I mean as double breasted its an obvious option. Thanks, now I have another one if you dont mind; I like a cut where the lapels meet quite high. The main V i short so to speak. David Bowie as example often had that, see https://goo.gl/images/iKiwE1 To me that is the first fifference I notice when comparing with the jacket by Poole’s. Can you tell some about that choice. Also I dont get what measure in your list that tells about this. I am a Yank and live in the Mojave Desert in southern, California. I favor English cut clothing, since my parents are immigrants from Glasgow. I am 85 years old, but would like to buy a double breasted blazer with the styling as shown above. Wide lapel 4-1/4″ to 4-1/2″, high peak lapels. After looking at ready made products and buying some which I have had to return, I find it impossible to buy one. It seems as if I have to spend upwards of $2,000 to buy something, (I don’t want to sell my Harley Electraglide to buy one) but even size 46 makes it impossible, as Italian and or English sizes seem to be about 38 or 40; no larger sizes. Could you possibly tell me where I could find such a blazer? I don’t know what the late model designers are thinking, no one fits in so called “modern fit” and or “slim fit”. It seems as if one would have to be a Tour de France rider to wear one! Am I too “out there” to make any sense? Thank you for your reply; it is indeed hard to find s blazer that I like, especially in US size 46. You can find them until the “cows come home”, but not in larger sizes. I guess that most buyers are in the size 38, 40, 42 range, and in one size, the blazer may be “modern fit”, “slim fit”, “classic fit”, “Italian fit” (small and and larger) and who knows whatever size! I’ll keep looking, and again thanks for the reply. Bit of a softball of a question. But where does the Poole house cut sit with regard to softness, on the spectrum from A&S to Huntsman? Having just read all three reviews I am inclined to think that the HP is best overall. It is not my taste but the trousers fit better than the others and it is clear that they have seen more of the Tailors iron than the others. The jacket is a much better fit especially around the armhole and back shoulder. I think the remaining two are being optimistic if they feel that they are offering good value for money compared to the HP submission. I’m travelling to Seattle (Washington State) from Vancouver (Canada) later this month to visit Henry Poole for what will be my first bespoke suit. I’m very much looking forward to it. I’ve poked around a little bit but can’t find a definitive comment on whether or not HP has a signature house style, any thoughts? Any advice/comments with respect to getting a bespoke suit made though a series of hotel visits rather than attending the storefront in the usual course? Cheers. You can get a decent idea of the style from coverage on here, particularly this style breakdown piece. 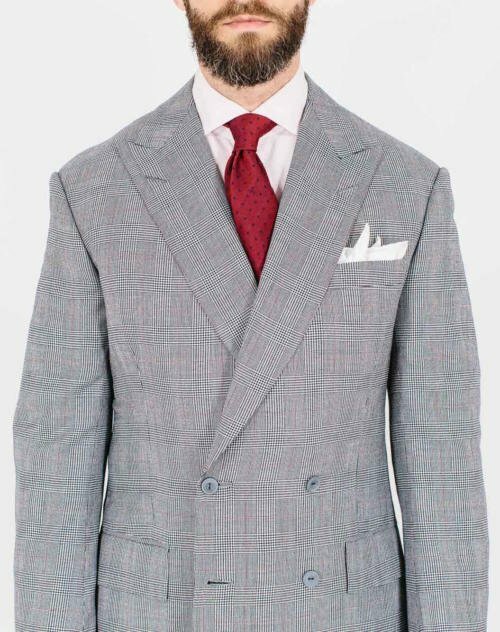 Basically, it’s a traditional English suit in cut and structure, a little lighter in make and less square in the shoulder than some (eg Huntsman) but also not a drape cut like Anderson & Sheppard. There will be some flexibility when you meet them, but go with their style and recommendations in general. In terms of making a suit through trunk shows, I’d say that preparation is important, as you can’t pop in a week later and change your mind. So have a good idea of what you want, and when you’re at the appointment for a later fitting, take a few minutes to wear the jacket if you’re unsure of any decisions around style or fit. Even five minutes of wearing it and walking around can help. And really try to mention everything you’re thinking or concerned about to the tailor. It’s not easy, but it’s worth it.